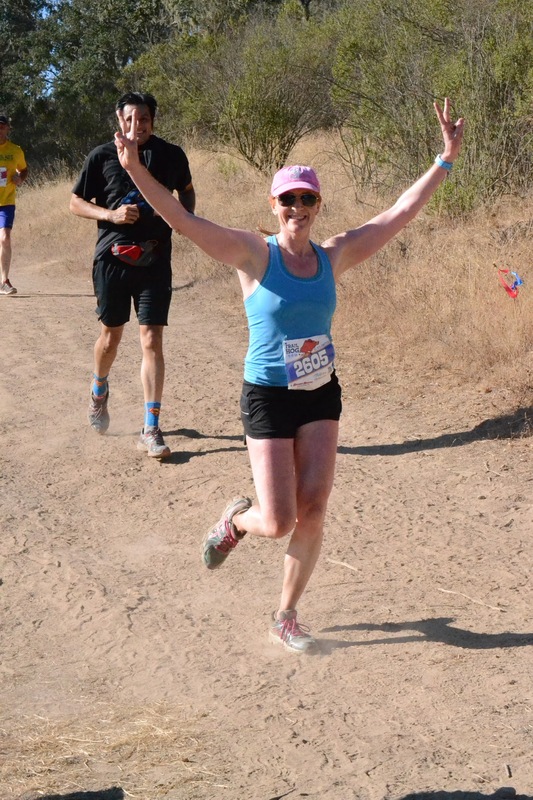 The good news: this was an amazing trail race. The bad news: thieves got into my car and stole my wallet and phone, and ran up $3,000 worth of expenses before we even got close to home. The good news: the card companies removed the charges without an ounce of hassle. The bad news: I have to buy a new iPhone, and good old AT&T is taking 10 days to send me a new SIM card. Sigh. The Brazen Racing Trail Hog 10k is awesome. It’s within the Joseph Grant County Park on Mt. Hamilton Rd in the hills east of San Jose, California, and takes you on a run with magnificent views of the surrounding hills including a close-up view of Lick Observatory. This was our second time running it, and you can be assured I’ll be back a third time. About a mile from home. A gentle climb to the finish. 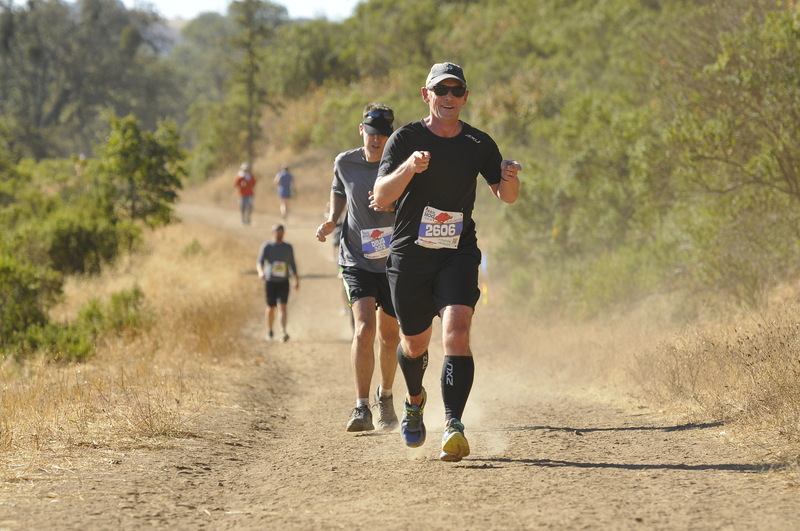 It’s a challenging, beautiful trail race. I’d imagine the Half Marathon is a tough grind, because the 10k certainly is (starting with the fact that it’s actually about 6.6 miles or 10.6 kms). At the 1.5 mile mark, there’s a pretty tough 500 foot climb — and after that it’s an undulating run that ends with a gentle climb back to the start. But, overall, it’s pretty hard to beat for scenery as the pictures show. I was the 4th male in my age group, and Selina was the 2nd in hers. We didn’t crank it out — we’re trying to get in the habit of running the races at a below-competitive pace in the spirit of making it through 52 races in the year. Anyway, that’s 29 races done! I opened the trunk of my car, put my phone inside, and closed the trunk. I walked away from the car without locking it, since my car locks automatically in 30 seconds or so when I take the key with me. I’m guessing as I walked away, the thieves quietly opened one of the doors a few inches. Once I’m out of sight, they popped the trunk, grabbed the phone, and then emptied out the console in the front and found my wallet. With the booty stolen, they jump in their car, and head for two different Walmarts to run up $3,000 in charges on one card. They also stop and buy $50 worth of gas on another card. Once I’m done with the race, I figure out I’ve been robbed. But we can’t call anyone from Selina’s phone, since there’s no cell coverage in the park. We drive back, cancel the cards on the ride, use the “Find iPhone” app to erase the iPhone, and suspend the phone service through AT&T. The card companies cover all the losses (thankfully! ), and AMEX even sent me a new card within 24 hours. Fidelity are taking their sweet time. And AT&T still hasn’t delivered my new SIM card. You live, you learn. Smart thieves come to races — since racers are definitely not coming back anytime soon. And you should lock your car manually — don’t wait for it to auto-lock, even though that’s a cool feature.